When I moved to the Dominican Republic 10 years ago, I didn’t know how long I would be here, and I still don’t know. 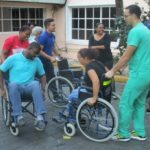 Throughout these 10 years, the ministry has morphed from primarily treating patients needing physical therapy, to primarily teaching Dominican physical therapy students, which certainly has a greater impact on how Dominicans are treating their patients. God has been very active throughout these years here, preparing me all along through relationships established and experience gained for each phase of the ministry. In addition to the physical therapy aspect of the ministry, God has been using me in my congregation and community in various service ministry roles. This edition will have fewer words and more pictures, in a recap of these years of ministry. More photos are available on my website. Thank you for joining this ministry! Please continue to pray for the students, the Dominican therapists, the community of Santa Fe and for God’s love to reach all corners of this island! 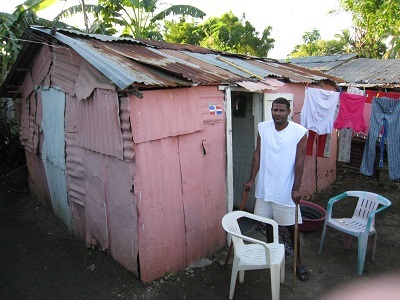 Consolation ministry (2008-now): Juan who suffered a spinal cord injury and returned home without hope. 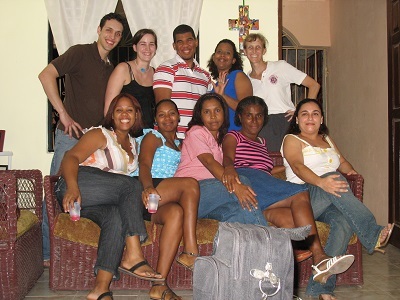 Clinic work (2007-2012 patient care, 2012-now ancillary role): Therapy staff with students from Regis University at my house. University ministry (2010-now) Some of my students learning wheelchair mobility. 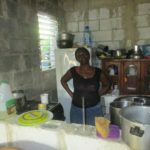 Construction ministry (2017): Maria is in her new, indoor kitchen. Thank you for your support for this ministry! May God bless and keep you as you bless those you meet. 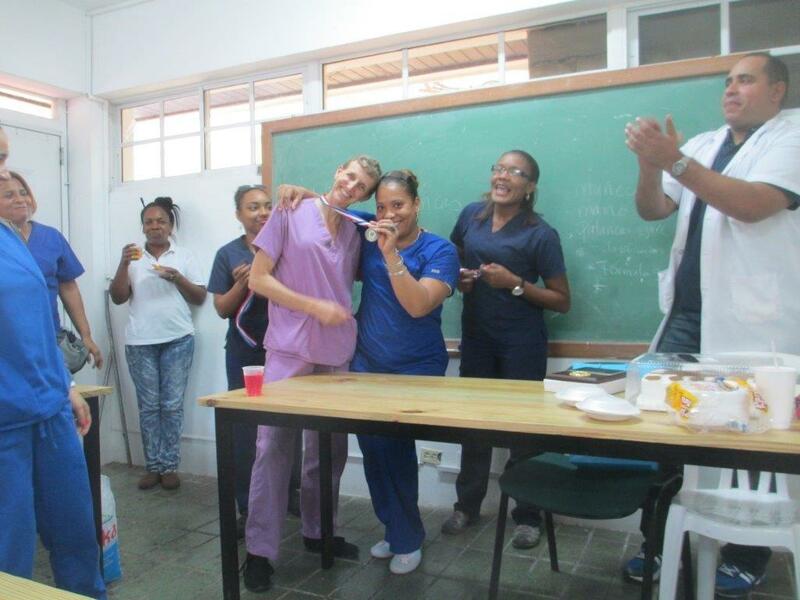 Cathy Donahoe is a SAMS Missionary and Physical Therapist serving in the Dominican Republic. Thanks to folks who responded with support for this new housing project, we have begun helping families. 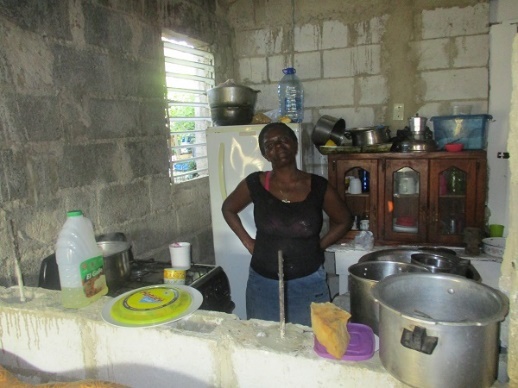 Mae is a widower with serious health issues that prevents her from being able to work. While she has a daughter, who is a professional, that daughter has a family with 3 children to care for as well. 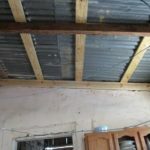 Her daughter helps as much as possible with medicines, it never seems to be enough and the condition of Mae’s house has been out of reach for needed repairs. 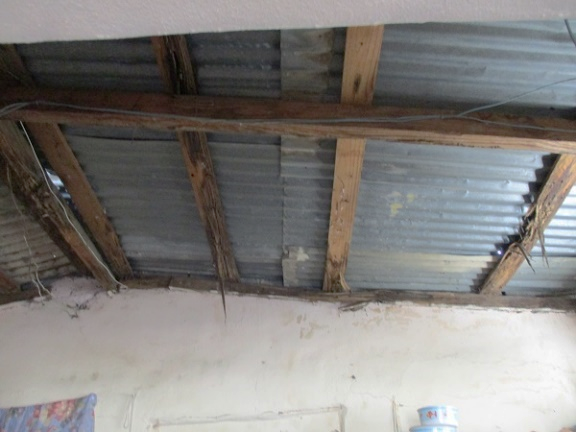 As you see in the picture, the wood supporting her roof was rotten in many places. 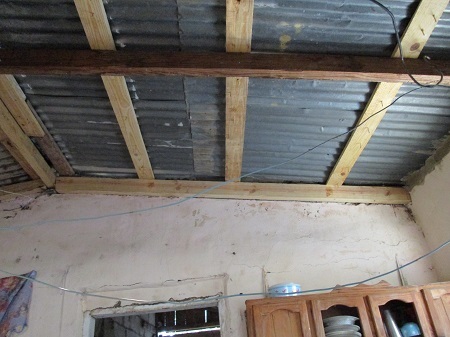 Working together with a local man skilled in construction, she sought others to help with the labor and our housing committee purchased the new wood and other supplies needed to repair her roof. It is still possible to join in this project as there are many families with needs. If you feel called to donate to this specific project, please send a check made out to SAMS, with “Donahoe project” in the memo line. 100% of your donation will go to materials and labor to improve people’s living conditions which will positively impact their health as well. Please pray for this ministry to make wise decisions and right actions to best benefit our neighbors in need. 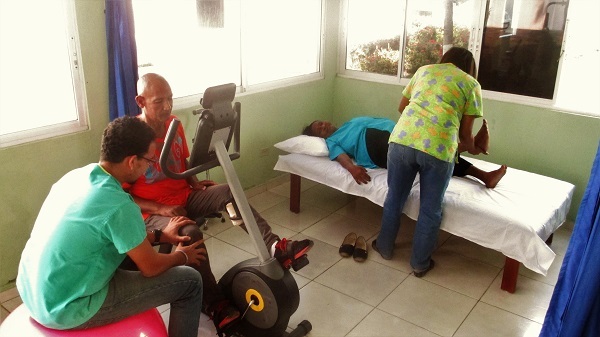 The PT clinic continues to be of service to the community. The months of December and January are typically slow months due to various holidays, but even so the PT area stayed steady. February has seen increasing numbers of treatments given per week with high levels of patient satisfaction. There is still much to be done as we try to negotiate with insurances to be providers which will help ensure the sustainability of the clinic and as we further promote the service now offered. Please pray that the clinic continues to serve with integrity and thus become self-sustaining. May you always sense God’s loving guidance and comfort in your life! Cathy is from Grand Junction, Colorado, and has been sent by St. Matthew’s Episcopal Church, Grand Junction, Colorado. Cathy is serving in San Pedro de Macoris, Dominican Republic. 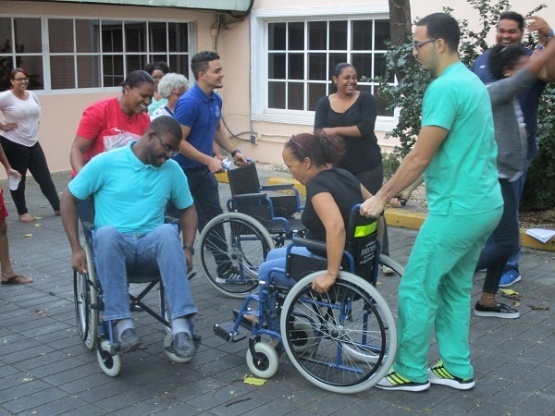 Cathy’s has been serving our Lord in the Dominican Republic since 2007 using her skills as a physical therapist. Her vision of this ministry has been to be working with the people of the Dominican Republic to help improve the health care offered. Health, in New Testament terms, is the capacity of individuals, families and communities to work together to transform the conditions that develop, in a sustainable way, their well-being, spiritually, physically, emotionally, socially, economically and environmentally. As a physical therapist, Cathy has been facilitating this through both treating patients and training people in physical therapy skills. 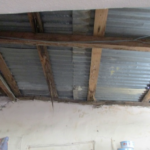 This has been happening at the Asociación Dominicana de Rehabilitación branch in San Pedro de Macorís as well as nationally through the ADR. Cathy has been to Haiti for brief periods as well, teaching in a program training rehabilitation techs, the first class of whom were working on the day of the quake and in its aftermath. Additionally, Cathy is doing her best to model a good Christian life. Cathy has become involved with ministries at her local Episcopal parish in the barrio of Santa Fe. 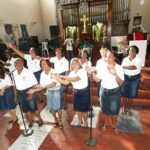 In addition to participating with the music ministry, she has been an integral part of the newly formed consolation ministry. They visit members of the community in need of assistance sharing scripture, prayer, and fellowship. This could be following the death of someone in their family, an accident or injury, or a variety of needs exacerbated by their material poverty and many times their informational void. Looking back on her life, Cathy can see God’s handiwork in preparing her for the mission field since an early age, though it took her a long time to get there. Key points along the way include serving in the US Peace Corps after college, meeting the bishop of the Dominican Republic one weekend in Colorado who has a PT clinic in his diocese with needs, hiking with friends on the Corkscrew trail in the Colorado National Monument when I heard of SAMS for the first time, and the first trip to the island of Hispaniola in 2003. That trip combined a month in Haiti and close to a month in the Dominican Republic. 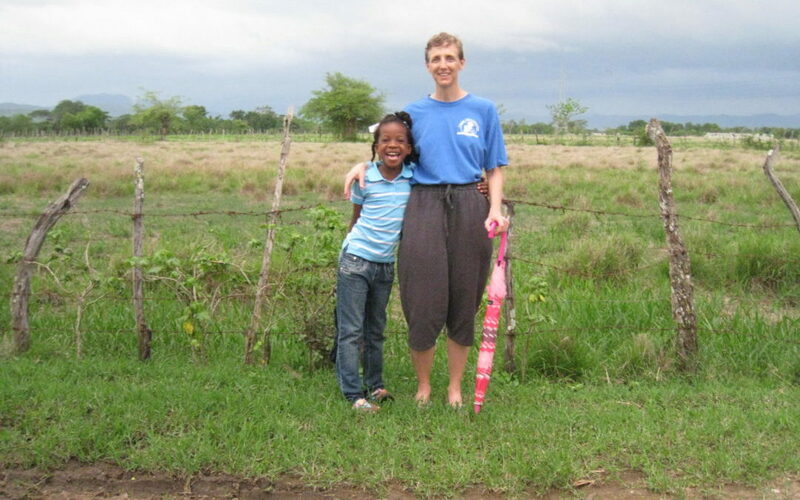 In Haiti her role was that of clinical PT teacher and in the DR it was as an aide to the staff at the bishop’s PT clinic. She was blessed getting to know the staff but was sure they could do much more for their patients. Ellen Snow, a missionary who coordinated short term teams and visitors, suggested Cathy return every year for a couple of weeks. Her final morning there, as she walked along the Malecon for the last time, mulling Ellen’s suggestion, her reservations about having any effect on a two-week-at-a-time basis were strong. Suddenly Cathy felt God nudging her with the question, why did it have to only be two weeks? Being one slow to make important decisions, it took another year and a half before she tested the waters with 6 months as a Bridger with SAMS at that clinic. This confirmed God’s call to long term missions, though it was not clearly in the same location. Resuming communications with SAMS upon return they determined that partnering together in this mission journey was the right plan. After going on her placement trip to Honduras and Haiti, it became clear that San Pedro was to be her destination for now. 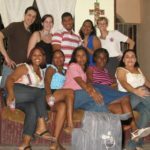 Pray that younger members of the Dominican church will feel called to the ordained ministry, and for the leaders and resources to train and equip them. 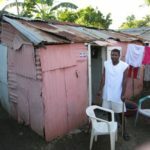 Pray for Bishop Julio Cesar Holguin of Iglesia Episcopal Dominicana and other church and government leaders to work together to combat poverty, crime, and violence. Pray for Cathy as she continues to teach Physical Therapy classes in the area. Pray for her students and that God will move in their lives. If you are feeling called to support or encourage Cathy, visit her missionary page here. When I was in 9th and 10th grade I ran hurdles in track and enjoyed the challenge of getting the steps right and clearing the hurdles well. Life presents us many hurdles of differing shapes and sizes, so getting the steps right is much more challenging. 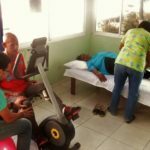 The opening of the PT clinic faced numerous hurdles throughout the process but opened mid-October. For me, the biggest hurdle was the last-minute dropping out of one of the therapists who had been planning to join us. She was the one I really wanted in the clinic because of her heart for Christ and her fellow-person. It caused me to doubt the opening, to doubt what others were saying to me and to doubt whether this was really a part of God’s plan after all. With prayer and conversation, a solution came to light that as an American PT made me uncomfortable, but this clinic is not in the US. A month or so after the opening, we have treated 20 patients for a total of 75 treatment sessions. Challenges continue to unfold but we continue to take them to God and find solutions. The goal to have this clinic sustain its monthly costs may take a few months to come to pass, but with God’s help will be achieved. Please pray that God be the controller of decisions for this physical therapy clinic, regardless of the hurdles that come before us. How much are you willing to step out and fight for your neighbor? God calls us to love our neighbor as ourselves, but do we? The Episcopal Church in the DR has a martyr to give us an example of truly selfless living and love of our neighbor. Back in the 1930s, the dictator Trujillo was in power in the DR and had little tolerance for the Haitians who were living in the country at the time. He ordered their removal resulting in a blood bath along the border of Haiti and the DR. Thousands of Haitians were massacred in 1937. Trujillo was controlling communications tightly and the Reverend Charles Barnes, a missionary Episcopal priest, wrote about it to contacts in the US trying to raise awareness of the situation on the island. One of his letters was intercepted and he was martyred on July 26, 1938. I was recently asked to give a sermon on readings that touched on justice merited by the Israelites for failure to comply with God’s commandments. While I didn’t bring Rev Barnes into the sermon, I did touch on whether we are truly reaching out to “save the weak and the orphan, defend the humble and needy; rescue the weak and the poor; deliver them from the power of the wicked.” (Psalm 82:3-4) With God’s help, we can help our neighbor in difficult times and as Christians, we are called to do so. Are you loving your neighbor as yourself? Please pray with me that you and I are strengthened through the Holy Spirit to respond to God’s call to us to truly love our neighbors, of all kinds. 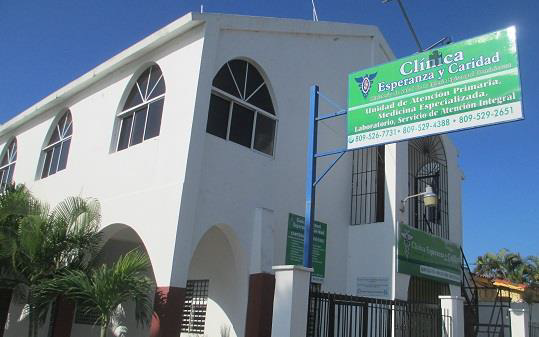 PT clinic, using space at the Clinica Episcopal Esperanza y Caridad. The bit of funding that they had to help get started, however, went to another purpose so that dream folded. 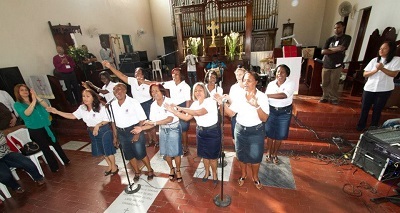 But the story goes on…..read more in Cathy’s Caribbean Quarterly.